We did it! 22 days 15 minutes and finally ReVision II is at anchor in English Harbour, Antigua and it is absolutely fantasticly beautiful. We hope to get to an internet cafe in the next few days and upload some pics from the trip but for now we are going to drink a bottle of champagne and then sleep. Andrew went to check in with customs and immigration and he hardly knew his name let alone answer all their questions. 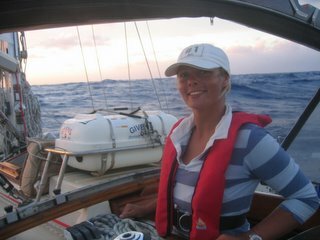 How I feel now about the crossing - glad it's over - it was the most amazing, scary, hard work, tiring, soul destroying thing I have ever undertaken in my life but how exciting to be in the Caribbean. Position 17 January 2006 2200 GMT 17 degrees 03 mins North 60 degrees 00 mins West. 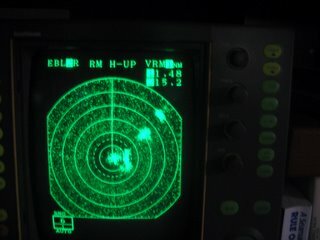 Only 102.7 nautical miles to go. With any luck we will make landfall in Antigua tomorrow (Wednesday). Carolyn just sighted an unknown creature alongside- not sure if it was a shark or a whale? Decided against getting closer to determine. All quiet this evening with light winds and a washing machine sea. Looking to a roll free night tomorrow. Position 16 January 2006 1900 GMT 17 degrees 11 mins North 57 degrees 01 mins West. Only 269.7 nautical miles to go. We are really starting to get excited now as in a few days we will be feeling Caribbean sand between our toes and tasting a rum cocktail or two. We heard from friends who arrived a few weeks ago to say they were anchored with their boat tied off to a coconut tree - how very cool! Well since we wrote our missing chapter someone out there is trying to prove us wrong. 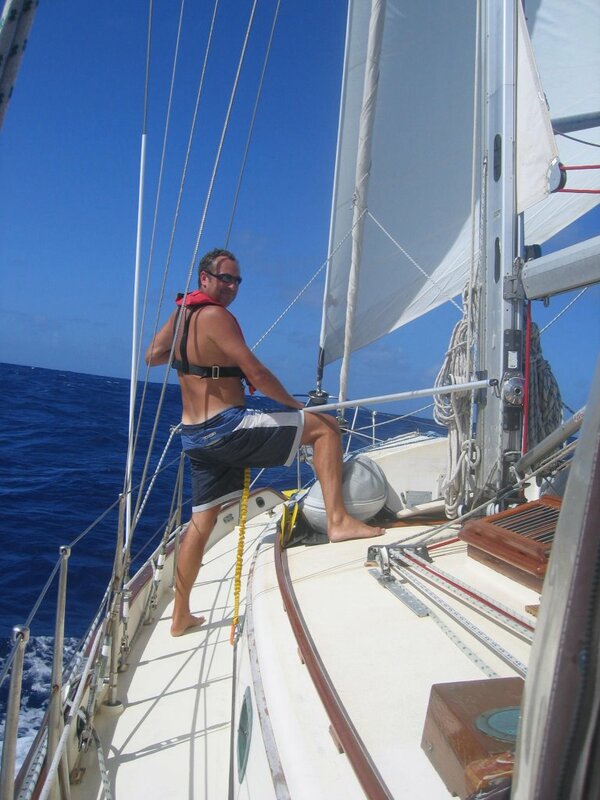 We had two days of sailing with full sails in 15-18 knots of wind with clear skies, no squalls and a gentle rolling sea - we have even been sitting night watch in shorts & t-shirt (without foulies). Then as of the early hours today the wind died and we were down to 3 knots of boat speed so we put the engine on and have been motoring in flat calm for the last 10 hours. This is great as all our batteries are fully charged, we have filled our water tanks and have had a lovely lazy day in the sun. We did take the opportunity to top up the fuel tanks with our three jerry cans while the sea was calm - so we also have a full tank of fuel. 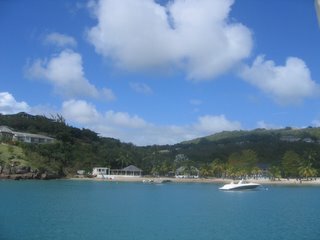 The first boat on our net arrived this morning at an island called Bequia, west of Barbados, south of St Vincent. The net has got very cheery as people are getting near to their destinations and the weather is improving. My thoughts from my perfect night watch 14 January - The Perfect Night Watch - 0000 to 0300 GMT, wind East 15-20, sky clear with just the odd cloud and full moon, wearing fouly leggings and t-shirt, bare feet, boat speed 6 knots. On a night like this you have time to think like you never usually do in life. I just ate an orange - it took me 20 minutes to peel and eat it properly. I peeled it like my Gran used to - take the whole skin off in one piece without any breaks. I made an awful mess but is tasted so much better than just cutting it into quarters. Usually I wouldn't bother with an orange or peeling it properly but is really was fab. The moon is so bright I am writing this in the moonlight (now copied up) It is huge and you can clearly see the man in the moon. It is directly behind the boat streaming moon beams across ReVision II's wake and lighting up the ocean rolling behind us. Only the brightest of the stars shine through the moonlight. I cannot see my faithful plough tonight - I must check my star book to see if it's left us or if it's just too bright. (Insert picture I drew of RII and the man in the moon - very good - honest). I read the title of a book today - Home is Where the Boat Is. This really struck a chord as I can't get away from thoughts about the couple who abandoned their home last night - First Light. All the things you would have to leave bobbing around in the ocean, all the memories and sentimental things we collect on the way as we travel and all the wonderful gifts from other cruisers. All the equipment and gadgets collected so carefully all in full working order but just attached to a boat that cannot steer. They must have been SO desperate and sad that they could not save their home, their boat that looked after them. I give them my thoughts this beautiful night. Position 14 January 2006 1100 GMT 17 degrees 21 mins North 51 degrees 41 mins West. Only 575.5 nautical miles to go. We have had cracking sailing for the last two days - storming along at over 6 knots day and night, it has been a bit bumpy but when you see the miles dropping down it really doesn't matter. We had a full moon last night that you could practically read by, which made such a difference to the night watch as you can see the ocean all around rather than just hearing it. We heard this-morning that the boat who lost their rudder have had to abandon their boat despite an attempt by a trawler to tow them to Barbados. We really feel for them. - update 20/1/06 just heard they arrived safe and well in Barbados. Position 13 January 2006 1200 GMT 17 degrees 39 mins North 49 degrees 21 mins West. Only 713 nautical miles to go. On the shelves of ReVision 11 and all cruising boats like her you will find books written by distinguished ocean travelers. Next to Jimmy Cornell you will find a Nigel Calder, a Les Weatherit and a Beth Leonard. Beth is a particular favorite of Carolyn's as she also covers girl issues. We feel however that there is a missing chapter in these books and have started to compile a few ideas which we will be passing on to Beth for her next edition. Position 12 January 2006 2058 GMT 17 degrees 56 mins North 47 degrees 50 mins West. Only 798.1 nautical miles to go. We have now covered more than 2000 nautical miles since leaving Las Palmas so to celebrate this evening we had another 8 cheeses pizza and a can of beer. This evening has proved the most beautiful so far as the wind is steady from the east and the sky crystal clear. The sun set a few minutes ago although clouds on the horizon point to another busy night on watch. Position 11 January 2006 2033 GMT 17 degrees 56 mins North 45 degrees 17 mins West. Only 946.3 nautical miles to go. So we have broken the 1000 mile to go point so we had the chocolates the Goolka's bought me for my birthday (we're saving the worms for another day - thanks guys yummy). Unfortunately we have been a bit preoccupied for the last couple of days as one of the boats in our net group lost their rudder yesterday morning about 130 miles south of us. Boats tend to leave in groups when there is a weather window, in our group there 12 boats on crossing spread over 1000 miles but in daily contact via one boat who controls the 'net'. The two closest boats were called to standby and give assistance, this being our friends on Argonauta 1 and ourselves. After a couple of hours it was clear that Argonauta would make it to the position before us, so we reverted to our original course after clearing with the net control. Argonauta reached them early this morning and confirmed that all crew were well and working hard to rig some sort of temporary steering. Argonauta have since moved off and the next boat will make contact with them in the morning. In the interim we have all been able to offer support and advice through regular radio contact. An article we had on board has formed the basis of their latest attempt and Andrew spent alot of time going through the detail of this with them this morning. Other boats have assisted by making satellite telephone calls and sending emails on their behalf. All our thoughts are with them tonight as they spend their second night in this very rolling ocean without any control over their boat - it must be truly awful. Life on boat ReVision II has been a bit lumpy, bumpy and squally over the last couple of days but today we have had a glorious hot sunny day with only two squalls. 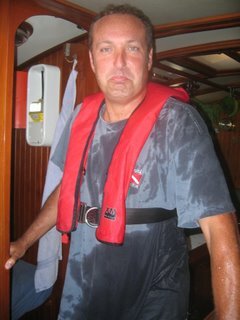 We are getting to the point with the squalls that we are not giving them the satisfaction of ruining our day so just carry on with what we're doing after putting a bit of sail away - they will not win!! Oh and Andrew nearly got knocked out by a flying fish last night while sitting in the cockpit on watch - it just missed his head, smacked into the boom and landed at his feet. He had to wake me up to tell me about it - unfortunately still not big enough to eat so I went back to sleep. Position 9 January 2006 2000 GMT 18 degrees 06 mins North 41 degrees 06 mins West. Only 1171.1 nautical miles to go. Well after our wishful thinking last night the winds continued to increase together with a few squalls thrown in and we had a pretty tough night all round. Today has been calmer and we have managed to catch up on a little sleep but we are both feeling a little jaded today. Here's hoping for a good night tonight. Position 8 January 2006 2000 GMT 18 degrees 37 mins North 38 degrees 55 mins West. Only 1301.3 nautical miles to go. That's over halfway now so we are really counting down the miles. After the last update we had a bit of a change in weather. It is not uncommon to experience squalls on this route although we have had a pretty intense period of squalls over the last 36 hours. A squall is basically a localised storm that lasts from a few mins to an hour, we get gale force winds and torrential rain. 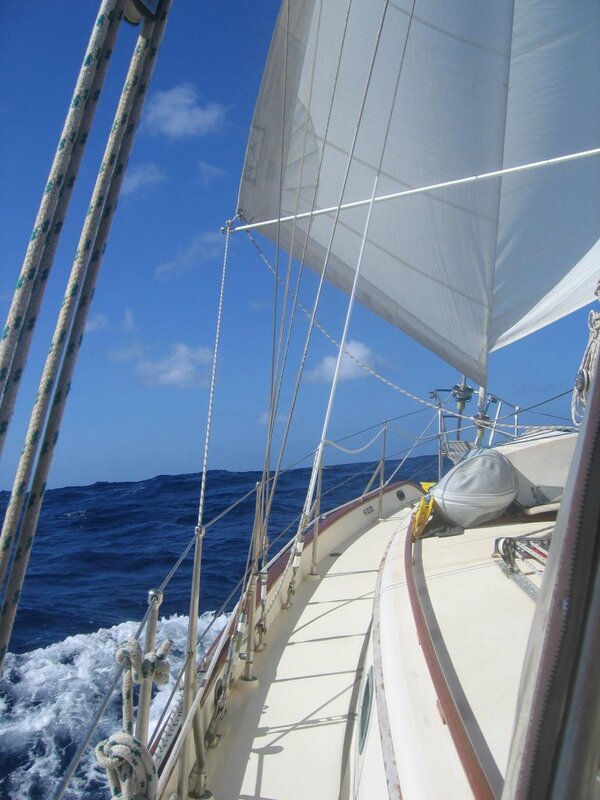 The squalls are pretty hard work and mean that we are constantly tending to the sails and steering of the boat. When the weather is good we keep a relaxed watch during the day and at night we keep a watch but usually from the inside checking all is okay every 10 mins or so. 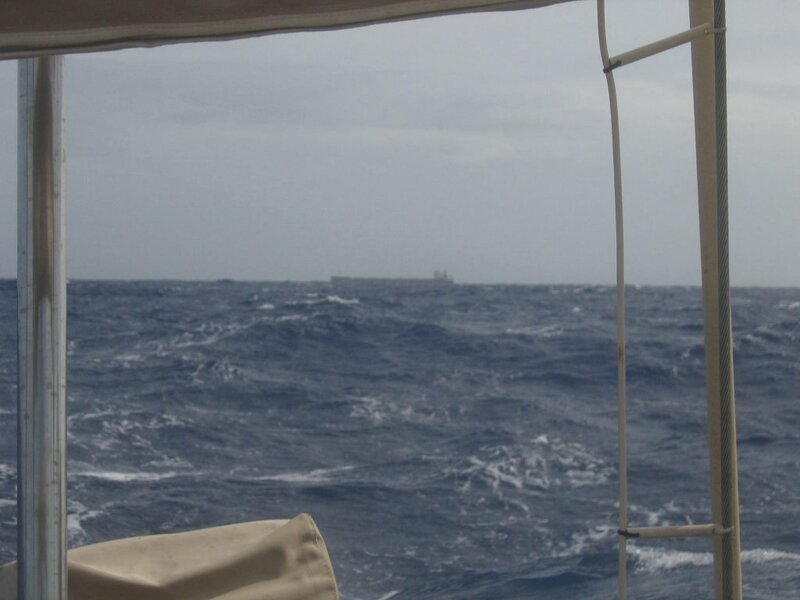 With the squalls one of us have to be on deck at all time monitoring the wind and trying to spot anything sinister heading our way. The seas are also very confused which makes sleeping difficult when off watch. We got so fed up with soaking our wet weather gear today we put on our swimming cosies during the squalls (bikini and safety harness - hmm a good look I think). 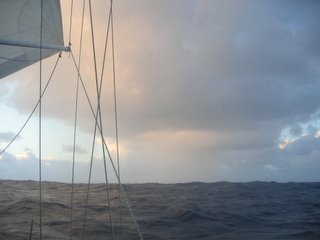 Anyway about 5 pm tonight we had a huge squall and when the sky cleared behind was our old favourite trade wind sky. Winds are still pretty strong but we hope to put the intense squalls behind us for a while. We used it as an excuse to celebrate with a beer. Despite the more difficult sailing conditions we are still doing really well and enjoying ourselves. Position 6 January 2006 1850 GMT 19 degrees 22 mins North 34 degrees 13 mins West. Only 1568.7 nautical miles to go. I think we can officially say hello from mid-Atlantic and I have to say I thoroughly recommend it as a destination. We really didn't expect to have such amazing weather. Today we have had 15 knots of wind out of the east and glorious sunshine. Andrew burned a square on his back today from his harness lines. 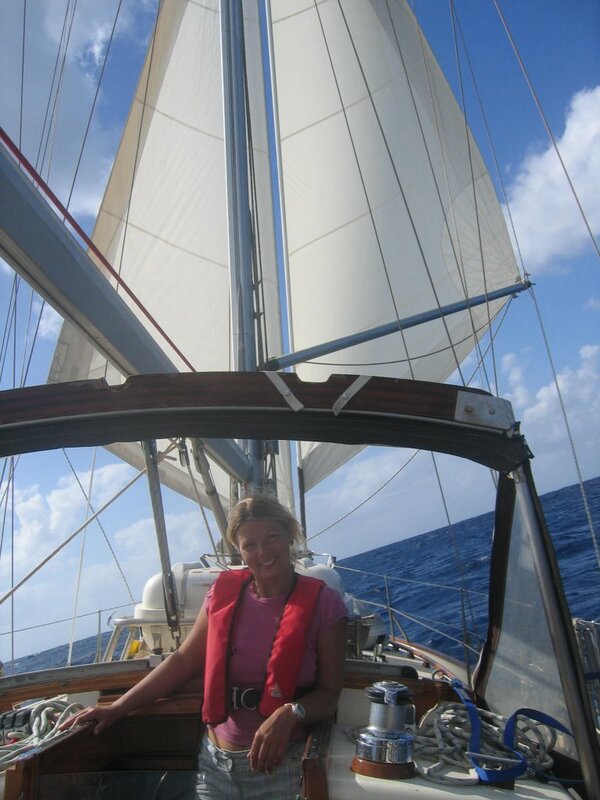 For me this really is the best sailing experience of my life - please may in continue just like this. We couldn't email yesterday as we were cut off due to excessive use. Luckily our friend Hugh on Argonauta 1 was able to email the provider, explain the situation and they reconnected us thankfully. Tropical Storm Zeta made an about turn and we were a bit concerned so overloaded on weather analysis. We are pleased to report it has now turned again so we can relax a bit. We passed our waypoint at 20 North 30 West (the traditional route turning point west) just after midnight on 5 Jan - to celebrate we had Christmas Pudding and brandy butter. (The old clipper ships used to say head south until the butter melts then turn west - so we had melted butter - it's the little things when you are this far from land!!). 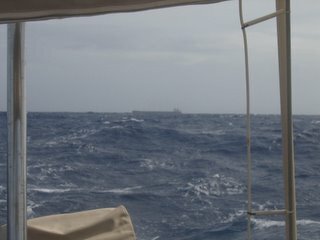 So we are well into the trade wind belt and enjoying it very much. 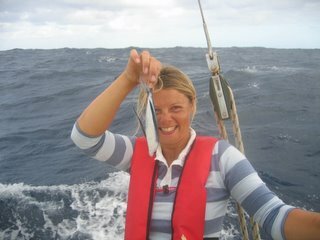 Today is a very special today for us - after spending far too many euros on equipment, numerous hours of discussion with other cruisers and at least 10 lures we finally landed a fish! Fish drill (the original not to be confused by imitations - Kika!) commenced at 3pm just after Lasagne and garlic bread was served. 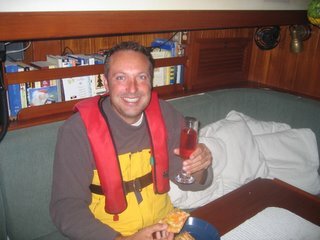 Andrew controlled the fish while I reduced sail, cleared the cockpit, put lunch on standby and got out the gaff and 'fish gin'. 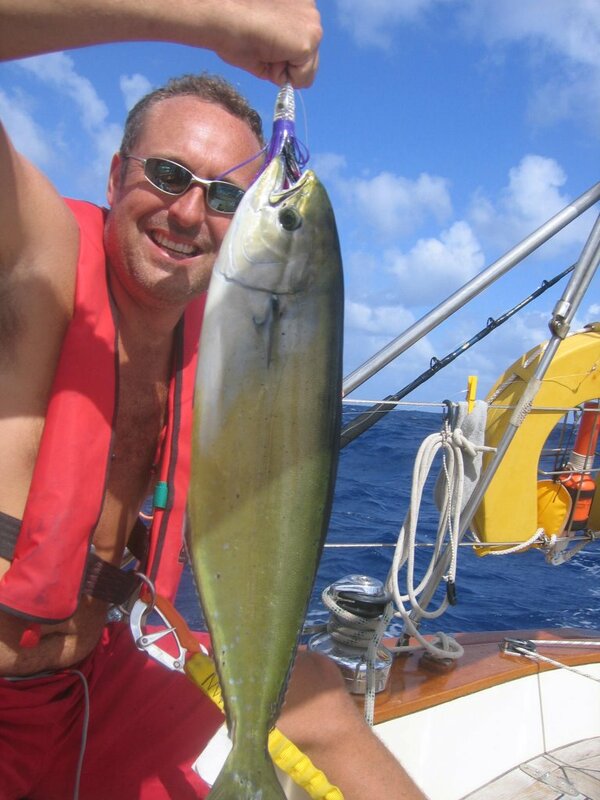 Having experienced many fish drills that amount in nothing but a moody skipper I was a little tense. However we landed a beautiful dorado about 6 lbs - just perfect for two! His skin was deep purple/blue but changed to gold as we squirted him with gin and he died - rather sad but now he is two large fillets for our lunch tomorrow and some marinating ceviche for our supper tonight - can't wait! Position 4 January 2006 1045 GMT 20 degrees 13 mins North 28 degrees 38 mins West. Only 1885.5 nautical miles to go. Just been so busy didn't get a chance to update last night - not sure what we've been doing but the days just fly by. 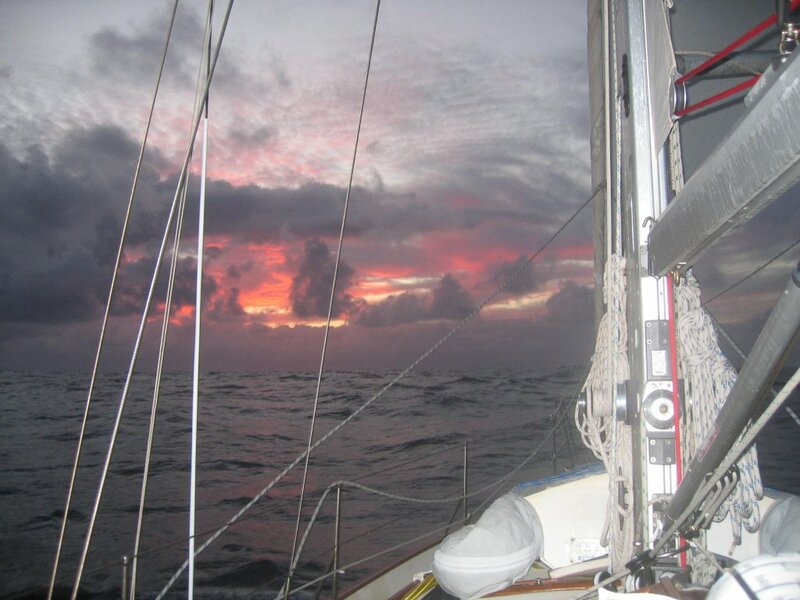 All is still going really well, we had another record 24 hours yesterday and logged 133 nautical miles. It was really hot yesterday so we did spend some time enjoying the sun and just watching the amazing ocean. 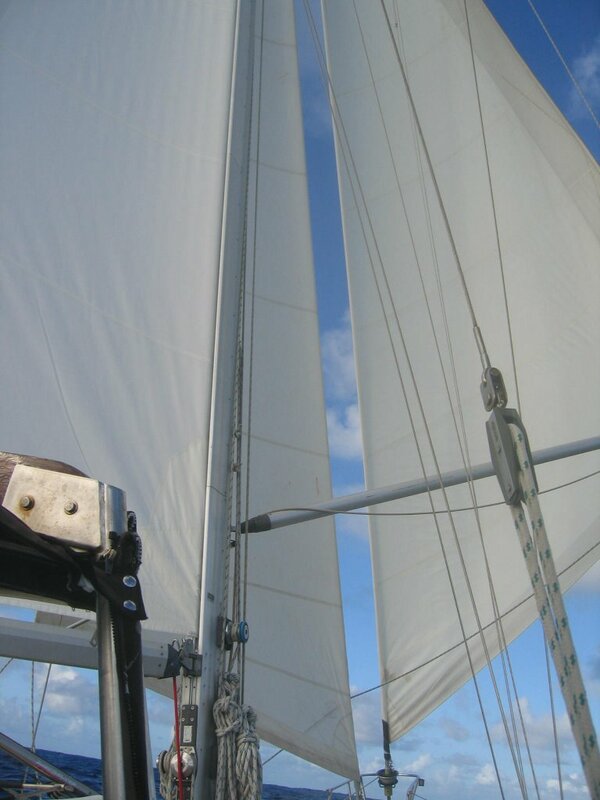 We have now rigged our two foresails poled out on each side of the boat to make the most of the wind coming directly behind us and the set up is working really well (Heath & Mary thanks for the advice). I managed to reef both sails on my own in the dark in just a few mins when a brief squall came through last night. We were very excited to find our first flying fish on the deck this morning - he wasn't big enough to eat unfortunately but he had a gorgeous deep purple/blue skin. I hope this might encourage Andrew to get his fishing rod out and catch me that tuna he's been promising since Hawaii. We should reach 20N/30W later today which is the traditional trade wind route turning point towards the landfall destination (supposedly where the butter melts but we're keeping ours`safely in the fridge) - this is a big milestone for us. Argonauta 1 left the Cape Verdes this-morning so are about 180 miles east of us hot on our tails. 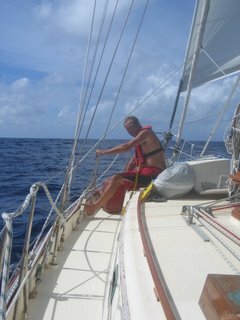 As I type this Andrew is making a cup of tea - it is hilarious to watch him in the galley with the swell - only 1 minor scald to report! Position 2 January 2006 2100 GMT 20 degrees 48 mins North 25 degrees 05 mins West. Only 2088.1 nautical miles to go. Today was the sort of day you dream of when planning a trip like this. ReVision II has been surfing down perfect waves with the clearest blue sky as a backdrop. We have been enjoying the sunshine and the exhilarating speed. Top speed today was 7.5 knots - wild! More importantly we recorded our best 24 hour run today - over 130 miles. We ran the engine briefly today for the first time since we left Las Palmas to top up our batteries, make hot water and run the water maker - so we are all replenished and clean. Andrew even had a shave! But then got dowsed in clean clothes by a rogue wave - he wasn't very happy the second time (both escaped me - tee hee). We ate the last of the fresh meat today but we still have plenty of vacuum packed as well as some frozen chicken and a leg of lamb so we are not doing too badly or venturing near the fray bentos pies just yet. Every day we consult the provisions spreadsheet and check all the fresh food. Some fruit and veg survives surprisingly well out of the fridge so we have a crate in one of the lockers as well as the infamous net on top of the refrigerated stuff. We hope to still have potatoes, cabbage, carrots, squash, sweet potatoes, onion, melon and oranges towards the end of the trip. Andrew is moaning about Muesli and yoghurt for breakfast and thinks he's on the verge of starvation. Today after muesli (which had lovely kiwi fruit on top) we had choc biscuits, sausage with mash and onion gravy, a snack of braseola and bread sticks and finally spanish omlette with salad so I've given him a packet of werthers originals to see him through the night - it's tough out here! Position 1830 1 January 2006 1830 GMT 21 degrees 44 mins North 22 degrees 36 mins West. Only 2230.4 nautical miles to go. The New Year arrived for us in cheesy style with Ocho Queso Pizza (because 4 cheeses is never enough to give you nightmares)and half a bottle of cheap Cava - both gave us indigestion all night but we had a fun time sitting out in the middle of the ocean on a beautiful night, before going back to our watches. Today has been hot and sunny all day and we've been back in our shorts again for the first time since we left. It appears that tropical storm Zeta will move North West away from us and so we have started our turn West towards the Caribbean. We are not sure if it's the effect of the change in course or it's just today but the rolling as a result of cross swell has been driving us crazy. The boat is constantly rolling side to side at over 30 degrees. This makes any small task a complete episode even sitting or sleeping let alone making a cup of tea or carrying out a sail adjustment! 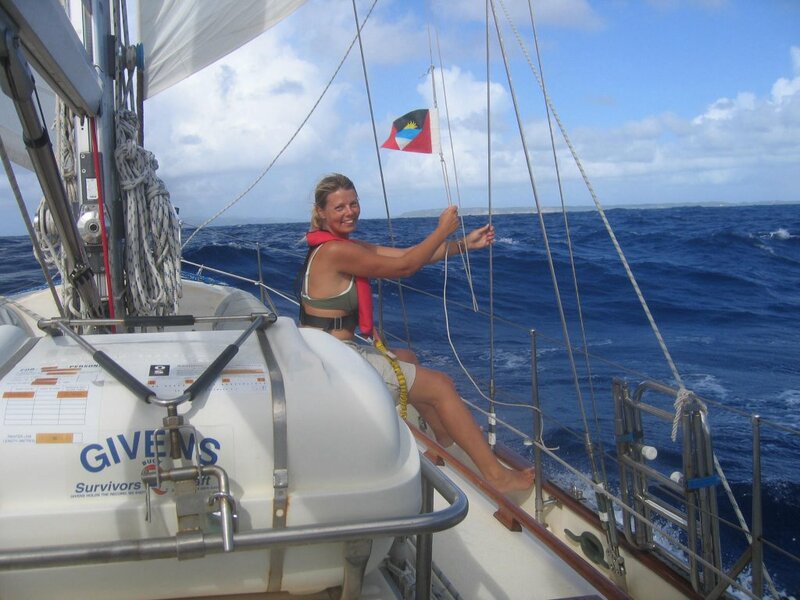 Our friends, Hugh, Heather and David on Argonauta 1 look set to leave the Cape Verdes in a couple of days so should not be far behind us as we go across. 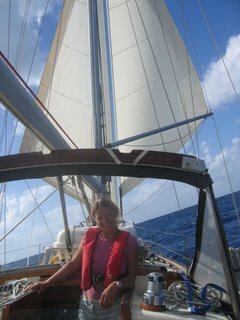 Our other good friends Elaine and John on Goolka, Bob and Talara on Imaginess and Sandy, Joan and Tom on Zeferyn are all set to leave Las Palmas this week so we will be in good company. We all have an informal chit chat every morning on the radio which is really great. We are waiting to hear how Jo and Tim from Rose Rambler are doing with their engine problem in Gomera and hope you'll be on your way soon guys, if not already. When we checked in with the net this morning we heard a yacht just over 70 miles away from us. We have seen no ships or yachts in the last couple of days just us and the ocean so on we go.